It’s been a weird couple of weeks. Last weekend I was supposed to fly to Cleveland, but bad weather kept me in New York. This weekend I made it to Cleveland, but even worse weather (in the form of Hurricane Irene) is preventing me from getting back to New York. If one thing ties these two weekends together (aside from the rain), it’s ice cream. Last week I wrote about the cinnamon dulce de leche ice cream pie that I made from scratch while holed up in NYC. This week it’s an ice cream dessert of a different nature: a traditional ice cream cake with real cake inside. I grew up eating ice cream cake from Carvel, which is all ice cream with a layer of crunchy cookie crumbs (“ants,” we called them) in the middle, but here in Cleveland I’ve discovered that it’s common to have ice cream cake with actual cake inside. Makes sense, I suppose! 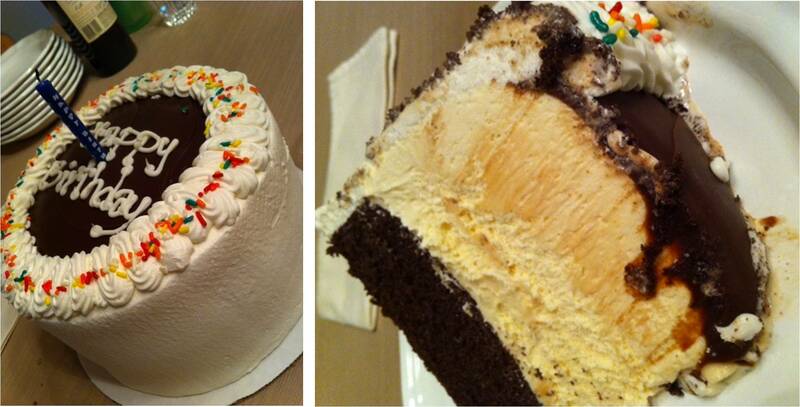 Which kind of ice cream cake do you prefer? This entry was posted in bakery, New York City and tagged cleveland, hurricane irene, ice cream cake, ice cream pie, new york city. Bookmark the permalink.